Growing up in the Wagner home in Napa Valley in the early 1960s, you wouldn’t find wine on the table. Instead, bottles collected around the feet of patriarch Charlie Wagner Sr., who would mix together different portions of the white wines on hand into an agreeable blend. The Wagner’s farming roots trace back eight generations to Alsace, France, whose aromatic and fruity white wines were the model for these dinner table blends. The mix of Pinot Blanc, Pinot Gris, Riesling and Gewürztraminer were radically different from the growing fashion for wines made in the style of either Burgundy or Bordeaux. Trading France for the United States, Carl Wagner arrived in Rutherford in the Napa Valley in 1906 to farm grapes, prunes and walnuts. Prohibition halted the family’s prospering bulk wine business, but subsequent generations returned to the wine trade in the 1940s and launched Caymus Vineyards in 1972. The family’s flagship Cabernet, Caymus Special Selection, first appeared in 1975 to instant acclaim. Looking to expand the family business, Chuck Wagner was inspired to produce a commercial version of the quixotic white blend his father made at home. In 1989, Caymus Conundrum was released, a non-traditional white blend seemingly out of step with an expanding North American market that craved Chardonnay and Cabernet Sauvignon with few exceptions. The out-of-the-box success of the new style would inspire the family to expand its vineyards outside of Napa, build a dedicated winery for white wine production a three-hour drive south in Monterey and spin off the brand as its own entity separate from Caymus. 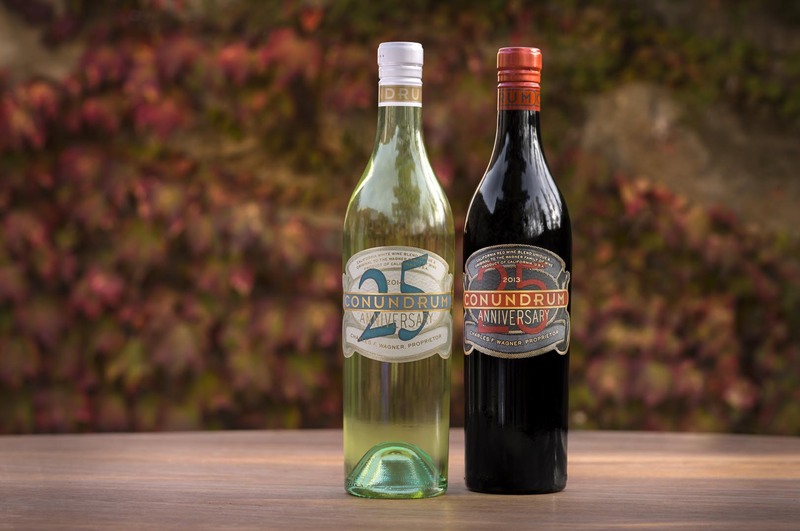 Today, the portfolio includes the pioneering white blend as well as a red, rosé and a sparkling wine that was released to celebrate the 25th anniversary. It also inspired a boom in the white blends category that continues to this day as winemakers around the world conjured up their own Conundrum-style wines. Wagner apprenticed under Jon Bolta, Caymus’s white-wine maker who was the architect of Conundrum White and continues to define its style, before being named the brand’s director of winemaking. He created Conundrum Red in 2011. 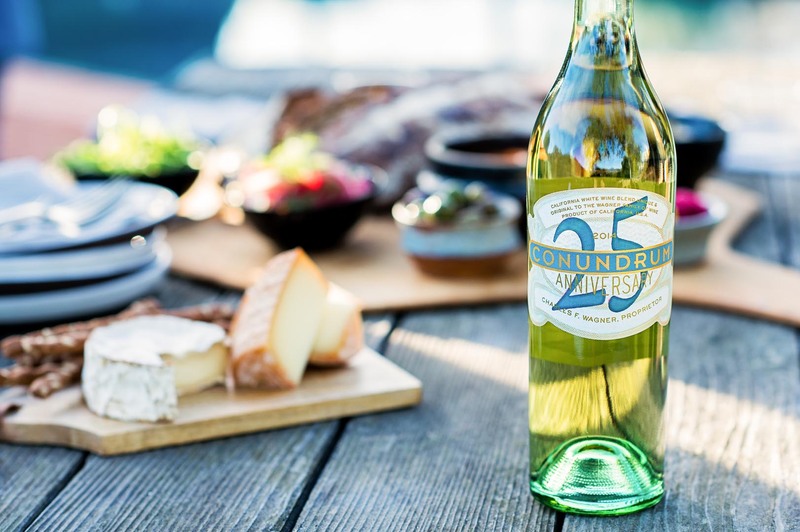 “The base blend for Conundrum White has always been barrel-fermented Chardonnay and Sauvignon Blanc that provide a round, mid-palate, which is enhanced by additions of Pinot Blanc, Pinot Gris, Viognier and Muscat,” he says. Each variety is fermented individually and aged separately until being blended by the winemaking team a few weeks before bottling. Grapes are cultivated in three different areas of California. Sauvignon Blanc is grown in Napa Valley, while the Chardonnay, Pinot Blanc, Pinot Gris and Viognier come from Monterey County. The Muscat comes from a family in the Central Valley who has supplied grapes to the Wagners since the 1960s. The initial contract was struck by Charlie Sr. and has carried on ever since. The hot days and warm nights coax out the perfumed, exotic character that makes the variety stand out. Wagner explains that the blend changes each year, following vintage variations and changes in consumer taste. One key factor is most years Viognier can be counted on to produce a healthy crop. In some cases, the vines only yield 25 percent of the expected volume, which leads the crew to seek out Chardonnay that has more floral and exotic flavours to fill in the gap. The newly released 2015 vintage is a drier than usual. It flies in the face of critics who write off Conundrum as an off-dry, fruit salad blend. “We think it’s more of a refined wine,” says Charlie. In the past, the winemaking team has looked to replicate the previous vintage’s blend, but the results never tasted the same. It takes time and effort to find each vintage’s personality. Blends are made on a small-scale, trial basis until the desired result is achieved. The custom-built winery in Monterey was created to produce white wine for Wagner family brands, notable Conundrum and Mer Soleil, and has helped streamline production and improve overall quality. “We have specialized crews at each facility, which brings a lot of clarity to the white or red production,” he says. The only white wine made at the Caymus winery in Napa is Sauvignon Blanc from Rutherford made by his sister Jenny for the family’s Emmolo label, which was established in 2012. The Monterey winery received the first grapes of the 2016 vintage August 1. The early harvest Muscat grapes are in line to produce the base wine for the sparkling Conundrum, a product originally created as a one-off to celebrate Conundrum’s quarter century milestone. “It’s been so well received, we’re gearing up for a 2016 vintage,” explains Charlie, who has also served as winemaker at Mer Soleil since 2003, which focuses its production on Chardonnay from the cooler climate Santa Lucia Highlands appellation in Monterey County. The demands of the job can be intense, especially during the harvest season. But Wagner thrives on the challenges.